Below you can find driving directions from Google Maps to help you get from Sunny Isles Beach to your nearest Fix Apple Now store, situated in Hallandale. You can either copy the driving instructions below or click here for a larger map and driving directions. 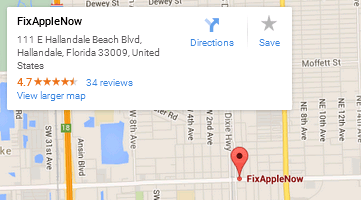 If you need to fix, repair, restore or replace your Apple device in Sunny Isles Beach, talk to Apple Fix Now. We have years of experience when it comes to fixing Apple devices like the iPhones 4,5 and 6, Mac Mini, iPad, iPod, iMac and the MacBook Air and Pro, and you can get in touch with us at any time if your machine isn't working as it once did and you need a fix quickly. We charge some of the most competitive rates for Apple device fixes on the market and can successfully deal with a whole host of problems, including incoming call screens not displaying, music apps crashing, your iPhone 6 not charging, red screens, crackling noise through earphones, unresponsive touchscreens and overheating iPhones to name but a few. Our engineers have years of experience behind them and know exactly what it takes to return your machine to its former glory. Why wait any longer to talk to us if you need to fix your iPhone in Sunny Isles Beach?